A beach wedding requires a few creative ideas to ensure a perfect wedding. From elegant tropical destination weddings to local nuptials by the sea, you can make wedding plans by taking advantage of some great ideas design just for a coastal wedding. Your perfect beach wedding starts with beach-themed wedding invitations. Look for invitations with shells, seahorses, fish, or beach scenes for a suitable theme. Colors can range from the beige and baby blue of a classic beach invitation to teal, pink, and yellow for a tropical beach invite. While a beach may be a romantic wedding destination, it can also be hot and uncomfortable in the blazing sun with no shade in sight. For your beach wedding, consider erecting a canopy, tent, or other shade for your ceremony, or keep your ceremony brief so you and your guests don't get too uncomfortable. Beach wedding flowers often incorporate exotic blooms and bold colors. Choose tropical bouquets and other flower arrangements to decorate your beach wedding, and don't forget unique options such as leis, tropical fruit accents, or flowers scattered on the sand. A sand ceremony is a beach themed alternative to the more common unity candle ceremony popular at many weddings. Both the bride and groom pour sand into a single container, symbolically combining their love and making a beautiful wedding keepsake. To make the ceremony even more meaningful, create a base with sand from the beach where you are wed. 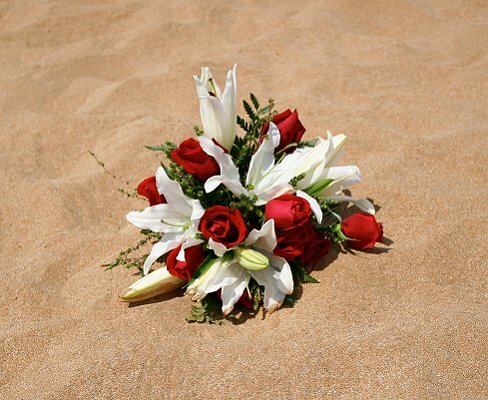 Sand sketches can be a beautiful and easy decoration for a beach wedding ceremony. Hearts, initials, monograms, and wedding wishes are popular options to carve into the sand around the ceremony site. If the sand is too dry to hold shapes, use shells, rocks, palm fronds, or other accents to create the shapes instead. Give your guests a bit of the beach to take home by choosing beach wedding favors. Tropical soaps, shells, vials of sand, and beach-scented candles are all great options, and you can combine the favor with a beach themed wedding favor tag or a tropical flower for an extra accent. Arches decorated with tropical flowers are popular for beach weddings. An arch may stand at the altar or could be at the beginning of the aisle for the bride to pass through. Also use arches to frame a photography site or decorate the reception entrance. There are many different styles of beach wedding dresses perfect for a sandy ceremony. Mermaid style dresses are popular because they show off the bride's curves, though some brides prefer casual wedding dresses for the beach. When choosing a beach dress, always consider the terrain, temperatures, and weather in addition to your wedding style. A beach is a very photogenic location for a wedding, and you want to be sure to capture that beauty in many different shots other than photos of just the couple or the bridal party. The wedding rings partially buried in the sand and framed with a tropical flower is a beautiful and romantic photo that can help capture the elegance of your beach wedding. Many beach brides choose bold tropical colors for their bridal party dresses. Teal, bright pink, and bold yellow are great options, or you can use a softer palette of seafoam green and ecru. Tropical prints or floral dresses are also great options for beach bridesmaids. Walking on the sand can be difficult in classic wedding shoes, so many beach brides opt for stylish sandals or bridal flip flops. Some brides even opt for a barefoot ceremony for casual ease, or you may choose beaded anklets and sandals for an elegant but still practical option. Capture the essence of a tropical beach wedding by incorporating leis, palm fronds, and tropical flowers into your beach wedding decorations. Lay decorations out on the sand, string them along a dock or boardwalk, or mount them on tiki torches for coordinated beach looks. A daring bride may want to show some skin for her beach wedding. Instead of a traditional wedding dress, opt for a lightweight sarong and bikini in white. If that's a bit too daring for your style, investigate a sundress, bohemian skirt over a swimsuit, or other unique attire in light, flowing fabrics. Your beach wedding won't be complete without some tropical touches on the reception menu. Carved fruits, tropical drinks, roast pork, and barbeque are all popular options for beach weddings. For a more upscale menu, consider shrimp or lobster, lime crusted beef, or traditional Caribbean or Polynesian dishes. Holding your beach wedding reception out on the sand can be a challenge, but it can also be a beautiful and unique event. Secure table linens in case of wind, and use white or pastel colors that coordinate with the setting without detracting from the beauty of the beach. Take advantage of the dramatic lighting on the beach for memorable wedding photos, such as a sunset silhouette photo or a beach kiss. Other great options include a kiss as waves are breaking on boulders behind the couple, or a distant shot of the couple walking away hand in hand along the water's edge. A beach themed wedding cake is a work of edible art. Popular designs include shells, fish, seahorses, or tropical flowers, and colors are often simple and pale to mimic the sand or surf. For a bolder cake, tint the inside a rich oceanic blue as a "something blue" surprise! If you want a beach wedding but can't manage a sandy ceremony, choose a wedding location that has a beautiful beach as a backdrop. Many beach resorts and hotels have groomed gardens that include gazebos, arches, or other overlooks across the beach perfect for weddings without the sand. The most important thing to remember about your wedding is to enjoy it. If you've always dreamed of saying "I do" on the sand, there are many beach ideas to choose from, and you can combine them to create a truly unique and memorable event you and your spouse-to-be will cherish.